The great mall Which was built by Petrie Dierman Kughn and Ford Motor Land Development in year 1994 at Milpitas. It is 50 miles south of San Francisco. It is very huge shopping mall covering approximately 1.4 million square feet area.Now Simon Property Group is its owner. 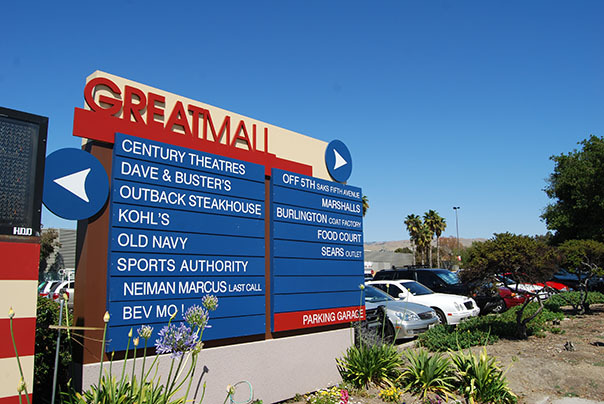 The Great Mall of the Bay Area is second largest Mall in northern California.There are the various outlet retailers such as Home Depot, Off 5th - Saks Fifth nue Outlet, Marshalls, Dave & Buster's, Sears Appliance Outlet . Hundreds of stores inside the mall like -Solstice,Banana Republic,bebe,Nike,The Chocolate Mountain are very papular here. It has several chain restaurants. Here all types of food from almost all cultres is available. There are stores for all price ranges. They have stores for both high end and low end brands. Even It is one story mall but having big area. There are theaters with 20 screens. It has more than 185 notable stores and 6,300 parking spaces. The restaurant food court has capacity of 700 people. ATMs facility is available here 24 hours.